The conditions defined in this dialog apply to the action control of the action selected in the "Index" list. An action control can have one or more optional conditions per action to dynamically decide if it is to be executed. In case the All conditions must be true is disabled this option will overrule it for this condition; This condition must be unconditionally true. The ID of an existing object in the Type category can be selected from the dropdown list. The state of the referenced object must match to this condition at the time the action should be triggered. 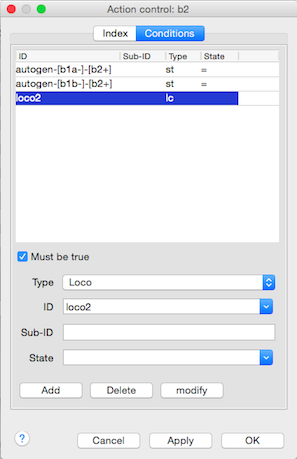 The field can be edited with the Loco ID or other values if necessary. signal red, yellow, green, white Multiple values are allowed as comma separated list: "green,yellow". sensor true, false, identifier² As second state value, separated with a comma, can the loco direction, "forwards" or "reverse". variable =number, >number, <number, !number, #text, ?text The value of the variable is compared with the state value. text text The contents of the text object will be compared with the status field. ¹) This only works in auto mode and with objects that contain a loco ID. The loco ID specified in the action condition must match with the loco ID contained in the object with the action control that triggers the action. The condition is checked using the loco ID contained in the object calling the action, not by using the loco ID in the action control. Objects containing a loco ID are routes, schedules, blocks, sensors linked to a block, switches and signals. With objects without a loco ID the action condition type loco will not work, also not when using a * for the loco ID in the action condition. ²) Read the ident event description for an explanation. ³) See below for all possible state descriptions. The ID must be set to * if this condition should be for all locos. The loco placing is also evaluated to determine the running direction. Possible state values are: diesel, steam or electric (case sensitive). The condition is fulfilled when the loco type matches the state. The ID must be set to * (using this condition for one particular loco does not make sense because the type is then already known). This also means that this condition can only be used with objects that can identify the loco (such as block sensors, blocks, routes). The side on which the loc entered a block can be used as state, possible values are + and -. This only works with blocks. The speed of the loco must match with one of the preset values min, mid, cruise or max. Note 1: Please note that when using block enter side or loco speed in combination with the action control block enter, the action(s) are evaluated before the block enter side and the loco speed are updated. If the state field starts with a '#' it will be interpreted as a loco address. The Loco ID will not be evaluated in this case and can be set to *. By using x in stead of # the action condition will be true when the loc address does not match with the listed addresses. When the loc address is not between 1 and 80 and not equal to 4711, the action condition is true. The function number must be between 1 and 28, and works only with locoID "*". To have the loc lights as condition function number 0 can be used. Changes to an object must be confirmed with this button.